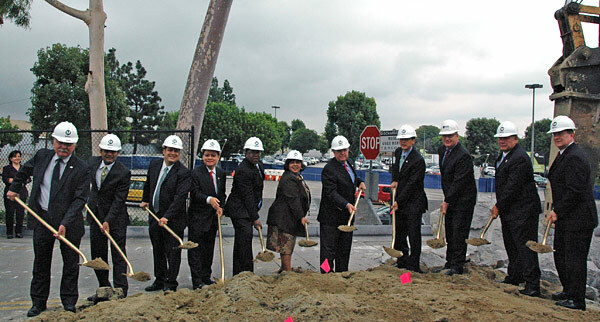 Metro joined local elected officials today [Wednesday] for a groundbreaking ceremony to officially mark the beginning of construction on a new state-of-the-art transit facility that will revamp and expand the current El Monte Station. The upgrade to the current facility, which first opened in 1973, is part of the Congestion Reduction Demonstration Program known as ExpressLanes and is funded by a $210 million federal grant by the U.S. Department of Transportation. Metro and Caltrans District 7, along with Foothill Transit, Gardena Transit, the Los Angeles Department of Transportation, MetroLink and Torrance Transit are partnering in a one-year demonstration project during which existing carpool lanes on the I-10 El Monte Busway (between Alameda Street and I-605) and the I-110 Harbor Transitway (between Adams Boulevard and the Artesia Transit Center) will be converted to High-Occupancy Toll (HOT) lanes called ExpressLanes. The upgrading of the El Monte Bus Station is an essential part of the success of the ExpressLane project in an effort to provide commuters, regardless of income level, with new and better travel options along two of LA County’s most congested corridors. ExpressLanes are scheduled to open in 2012. “Today marks the beginning of a new era in the San Gabriel Valley as we expand the busiest transit center west of Chicago into a modern, state-of-the-art facility that will increase passenger capacity and increase the number of buses the station can accommodate that will enhance transit services for thousands of daily commuters,” said Metro Board Chair and LA County Supervisor Don Knabe. 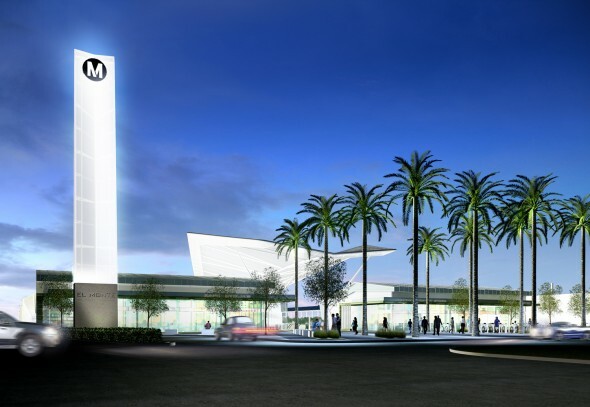 The $45 million El Monte Station construction project will consist of a new two story building that will house a public bus and terminal station with limited retail space, a customer service center and surface parking. Final construction is anticipated to be completed in May 2012. Once completed, the facility will be twice its current size and include modern amenities including variable message signs, intercoms, closed circuit television, solar panels, wayfinding equipment and information displays, new elevators and escalators, a transit store, bike stations and lockers. Public art by renowned artist Donald Lipski also will be incorporated in the station as part of Metro’s public art program. Project highlights of the new facility include an increase in daily passenger capacity by 82 percent (from 22,000 to 40,000), increase in bus bays by 87 percent (from 16 to 30), installation of 30 bike lockers/storage units, better accommodations for both 40-foot and 60-foot buses and enhanced law enforcement presence. The station also will support additional bus service on the I-10 El Monte Busway to enhance the performance of the I-10 ExpressLanes Demonstration Project. The new facility will use energy efficient and sustainable building methods and will be built to Leadership in Energy & Environmental Design (LEEDS) Gold standards. Construction of the new facility will generate more than 350 construction-related jobs. The construction work at the El Monte Station is being done by KPRS Construction Services based in Brea under contact to Metro. In August, Metro completed construction of a temporary bus station in an adjacent lot to accommodate passengers using the station during construction. Parking for El Monte Station patrons will be available to the north and south of the temporary bus terminal, including a recently added parking lot. Metro will make every effort to minimize impacts to patrons during the construction period. Signs guiding both vehicles and pedestrians around the transit center will be posted and pedestrians will be redirected to safe areas outside the construction zone. For construction updates and information, the public can call Metro’s Community Relations Construction Impact Hotline at 213-922-7900 or visit metro.net/elmonte. So there isn’t any LAX FlyAway serive at El Monte Bus station? LA Metro has been claiming this for months and in multiple publications! It looks like there’s been an error in the materials for El Monte Station listing FlyAway as one of the lines serving the station. It’s not – nor are there currently any plans for it to serve the new station. I’ve alerted the project team and they’re removing the references to the FlyAway on all El Monte materials. Thanks for catching that, apologies for any confusion it caused. The new station looks great so far,cant wait till its open! How much you wanna bet NOT ONE RIDER GETS CONSULTED (or even CONSIDERED!) in how this $45 MILLION transit terminal is gonna LOOK! It would be a great ideal that the Flyway do serve the El Monte station. There are so many people live in surrounding San Gabrial Valley that travel to or work in LAX. All you have to do is extend every other or third bus that start in Union Station to start in El Monte instead, utilize the existing El Monet busway to Union Station and resume the regular route to LAX.